The Sponsors listed below have shown that they are dedicated to preserving and continuing American Manufacturing. They are creating jobs and improving the US economy as a result. Please take a moment to visit their web sites and show your support by purchasing their products and sharing their information to others. 360 Cookware manufacturers high end cookware in the USA. All of their cookware is made from non-leaching T-304 stainless steel and employs vapor technology and waterless cooking that seals the nutrients in your foods to make them healthier and more flavorful. When you shop with 360 Cookware you are not only supporting American manufacturing but helping to keep over 9,000 Americans working. Goodwear Clothing is an upscale brand of domestically manufactured apparel known worldwide for it’s superior quality, fabric weight and unique styling. You can tell they take pride in every stitch. Since 1983, Goodwear has produced top-quality Made In USA T-shirts and sweatshirts. Our products are American made at every step along our supply chain, from US-grown cotton to domestic ginning and spinning, to assembly with American truckers transporting our raw materials and finished products. We’re proud to offer some of the best quality Sweatshirts and T-shirts available, while at the same time creating and keeping jobs here in the US. Good for you, good for American workers. That’s Goodwear. The American-made Shirt Company. Liberty Tabletop is a USA manufacturer of Flatware. Sherrill Manufacturing and their brand is Liberty Tabletop, a family owned and operated business co-owned by Matt Roberts and Greg Owens. Created with pride in Sherrill, N.Y. factory, which has been producing quality flatware for more than a century. Liberty Tabletop offers a variety of patterns designed to satisfy almost any taste. Now the only manufacturer of flatware in the United States of America, Liberty Tabletop creates high quality flatware at a competitive price. All of their items are produced using the finest quality 18-10 nickel/chrome stainless steel. This offers incredible luster and enhanced resistance to staining over less expensive stainless grades like 18-0. What’s more, the steel thattheir flatware is produced with is also made in the U.S.A. and meets all ASTM standards. Their steel is tested for lead and other toxic trace elements to ensure they are not present. This protects the health and safety of their customers and our workforce. No mystery metal in our product! DutchCrafters is a USA manufacturer of Home Furniture, toys and more. Their American home furniture is made in Amish country – handcrafted in the beautiful rolling hills of Pennsylvania, the back roads of Ohio, or along the amber waves of grain in Northern Indiana. There is something special about American made furniture, especially Amish furniture. All DutchCrafters furniture is made by expert craftsmen using small tools powered by generators and their own hands as they have for decades. More often than not, they are family businesses where children learn the craft from their parents who learned it from their parents before them. This stands in stark contrast to imported furniture, made on assembly lines as quickly and cheaply as possible, where shortcuts are commonplace and quality is only a necessary minimum standard. Authenticity 50 is a dream of Jimmy & Steph, the Husband/Wife Co-Founders of Authenticity 50. On a mission to outfit our home with Made in USA products we couldn’t find Luxe Made in USA Bedding. We researched why there was no made in America bed sheets and found two answers; it’s expensive to manufacture here and retail markup is crazy, often 5-10x. But if we cut out the crazy retail markups, we knew we could offer great value to our customers and fair wages to American workers. Our sheets are 100% ‘seed-to-stitch’ made in the USA. What does that mean? It means the entire manufacturing process – from growing the cotton, to spinning the yarn, to weaving the fabric – is done here. Flexsystems is a USA manufacturer and importer of custom 3D flexible PVC labels and molded plastic products. We are located in San Diego, California. From phthalate free PVC and flexible PVC, recycled PVC to silicone labels, rubber patches and rubber emblems, sewing labels, four color process labels, garment labels, waterproof garment labels, injection molded parts, custom TPU and EVA plastic promotional products. We can make almost any item you like with our flexible 2D and 3D custom process-sew on custom emblems for hats, bags, polo shirts, labels for cover ups, key chains and more. Dedicated to World Comfort To ensure your year-round comfort and satisfaction, we use only the highest quality tightly woven flannel. Our flannel is not like regular flannel. It doesn’t shrink like regular flannel. 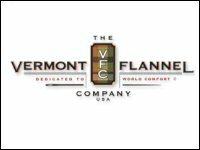 The Vermont Flannel Company guarantees 100% customer satisfaction. If there is anything we can do to make you, the customer, feel more comfortable, please let us know. Bullet Blues Custom Apparel. embraces an American way of living. Combining superior quality and design with high-quality fabrics, Bullet Blues offers clothing that is comfortable, sophisticated and durable. From the denim fabrics to the final stitch, Bullet Blues proudly enlists 100% American craftsmanship and resources. The women’s collection includes chic designer tops, jeans and dresses. Each piece in the collection is versatile, giving ladies the ability to effortlessly go from dressy to casual. The men’s collection offers the same uncompromising quality and style, and each piece is specially tailored to make men look and feel great. Jill Joanne creates her designs in her cottage by the sea. From a young age, Jill had a gift for creating beauty all around her and decided to share her creations with everyone. Her passion is to create a company that will also help others to discover their passions in life. Made in the USA. Christmas Forest Since 1976, when we sold our first Christmas wreath at Pike Place Farmer’s Market in Seattle, we have focused on pleasing our customers with forest fresh Christmas wreaths, and now we have loyal customers worldwide. Our craftspeople join with nature to create exquisite Christmas wreaths out of the finest greenery, while protecting Mother Nature. If you are a US Manufacturer and would like to participate in the We Pledge Made in USA campaign and show American Consumers how much you care about our economy and producing quality made in the USA products, please use the contact form and one of our staff members will contact you.